Although it would be fantastic to sit next to the other high rollers at the baccarat or roulette table in a real casino, sometimes reality kicks in and we find ourselves having to do the next best thing – playing your favourite table games in a live dealer casino online. Every gaming portal which we recommend on AsiaOnlineCasinos.com features a live dealer games section. In some casinos, the selection of games is larger than at other providers – also the betting limits vary (more on that in the individual casino reviews – see below). They do, however, have one thing in common: The quality of the games is to the highest standards. In addition, you don’t have to be glued to your desktop anymore, since many gaming portals already offer various live dealer games for your smartphone and tablet too. Most live dealer games are available via instant play (no download) and on mobile devices. Anyone can play since the betting limits range from low to high roller stakes. In addition, high roller/VIP tables are available. Enhanced visuals and different camera angles ensure a smooth and accurate gameplay. Features, such as bet behind are also common online. Depending on the game and software provider, each player usually has between 10 to 20 seconds to place their bets. Live chat functionality to communicate with the dealers. Depending on the online casino, European and Asian dealers lead the game. Whether it be on your desktop computer in the comfort of your own home or on a mobile device while you’re on the move (given, you are connected to the net), live dealer casinos containing live video streaming offer an enriched experience to anyone with an interest in playing casino games. Now, live dealer casinos from Asia and Europe provide access to video streams that make an online gaming experience feel like reality! All of the things you could expect, from convenience and comfort to the ability to keep track of your bets are available in order to make your experience as authentic as possible. Once you have tried this new, virtual way to play the online games you love, you might not want to go to a “real” casino again! Currently, the most popular live dealer casino games include baccarat, blackjack and roulette. These three games you will find in every live dealer casino. However, games such as Sic Bo and Dragon Tiger are becoming more common and can also be found on specific websites – please refer to the specific live dealer casino review (see table above). Asian’s most popular casino game, baccarat, is one of live dealer casino’s top choice in their list of games offered to players. There are usually many blackjack and roulette tables available too. Each game even has a number of alternatives players can choose from. This includes games with a progressive jackpot side bet, multiplayer tables and more. This of course also depends on the online casino you decide to play at. Given that you are playing the regular casino software games, bets for just $1 per hand (or currency equivalent) are possible. Live dealer games do, however, come at a price as minimum bets are usually a little steeper than normal online games. A game of baccarat or a hand of blackjack may be played for a minimum of $5 while roulette is usually $1 per round. In regards to maximum betting limits on live dealer games, high rollers enjoy the possibility to bet anything from $100 to tens of thousands and above. Depending on the casino, either dealers from Asia and/or Europe are on board. In addition, the user interface of the live dealer games may very well be localised in your respective language. Players can take advantage of the instant relationship they make with the dealers. Different tools give players more options on how they continually converse with dealers as they keep track of how they deal cards or conduct themselves at the table. Every game provides its own unique user interface which gives players the ability to manage how they play games through an on-screen display as they watch the action take place through different camera angles. This on-screen display will also supply players with access to information which can cover anything from details of how to play the game to checking your bet history. As the quality of the live audio-visual transmission relies on the speed of your internet, this can mean the difference between having a high definition quality stream or not. HD live streaming requires high speed broadband and this can also depend on the quality of the device you are using. Without both of these things, you could suffer from time delays where the dealer jumps from one scene to the next. Instant results are still produced, however, and in blackjack for example, the dealer cannot continue until each player has decided how they want to play, unless they reached the time limit for their turn. Depending on the interface layout you chose, the view of the cards is enhanced – in most cases the cards being larger as compared to a standard deck of cards. Due to the time it takes for each player at the table to make their move, the velocity of play is slower than at the virtual table games. For instance you may get up to 10 seconds to decide your next move at blackjack or up to 20 seconds to place your bets at the baccarat table. More gamers are demanding a better and more complete online experience. It’s for this reason that some live dealer casinos in Asia are now offering their customers a fuller experience by making more types of table games available. These games can range from different forms of poker such as Casino Hold’em or other card games like Red Dog and Casino War to dice games like craps. Equally large on the Asian market is the selection of live casino providers. Some of the best known games providers are, among others, Asia Gaming (see video below), Ho Gaming, Gold Deluxe, EntwineTech, and Top Trend Gaming – all of them available at one of the largest Asian Live Casinos: Live Casino House (available to players in many Asian countries). However, it’s not only the type of games that are offered on these websites that will make you feel like you have had a memorable experience. Other factors that will affect whether you return to the website again or not can include the effort you need to make when depositing for the first time to the complexity of collecting your winnings. It is important therefore, that you only choose the best online casinos, such as the ones featured on AsiaOnlineCasinos.com, to ensure the best gaming experience possible. Playing live dealer casino games at the most well-known online sites such as Royal Panda or Cherry couldn’t be easier! All you have to do is decide which type of payment method you would like to use (e-Wallets including ecoPayz and iWallet are recommended) and register your details for an account. Most online casinos offer their live dealer games as part of the games collection which is instantly available on the website. No software download is therefore required for the games from enterprises such as Evolution Gaming, Amaya (Ho Gaming), XProGaming and NetEnt. In many cases, traditional download casinos that run Playtech and/or Microgaming software also offer their live games download-free on their website. Of course the games are also available through the downloadable software. Is it safe to play at live casinos? I’m new to live casino gaming, how do I get started? How do I deposit at a live casino? How do I find live casino sites? What are the betting limits in live dealer games? Can I play free live casino games? Can I play live dealer games on my smartphone? What are dedicated table games and general play table games? Can I talk to a live dealer? Can anybody see me when I play at live casinos? Can I play live casino games in English? What about other languages? Whereas the average online casino offers RNG (random number generator) games, a live casino is different in that it provides live casino games. Live casinos or live dealer casinos are sites which offer streamed games. The games themselves are played over a video feed streamed from a brick and mortar casino or a studio. Players still place their bets and make their decisions via an on-screen menu, just like they would in an RNG game. However, the action is played out by a real-to-life human dealer with whom they can interact with. That all depends on several things. If a live casino holds a respectable gambling license (out of Malta, the UK, Gibraltar, Curaçao or other regions), then that certainly helps. Other things to look out for are fair play certifications (such as London-based eCOGRA) and software from widely recognised developers. Safe live casinos will also have no real history of complaints against them. Live casinos which fail in most of these regards are more likely to be questionable, or worst still, rogue casinos. Find a casino which offers live dealer games – see list of recommendations above. Click on the sign-up, join now or register button on the homepage to begin the process. Complete the e-form which appears and submit it to register at the casino. Confirm your casino account registration, either via the verification link that is found in the welcome e-mail or via the SMS code sent to your phone. Sign-in to the new live casino account and deposit. That’s all there is to it. Depositing doesn’t need to be a chore at live casinos. 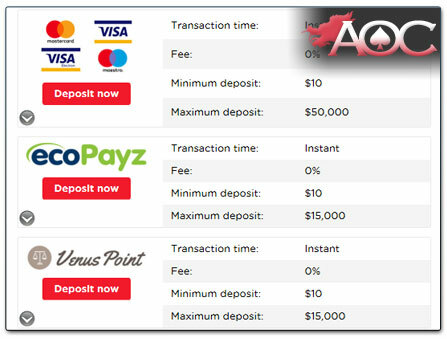 Each live dealer casino will have a page dedicated to banking and payment methods. From there, you can see the banking options they have open to you – most will be credit card and e-wallet options. You then select the payment option which appeals to you or one that you may be using already/have an account with (such as an e-wallet). In the final step, you enter the amount you wish to deposit and confirm the transaction. The process is similar to buying something from an online shop. Most Asian players will tend to use the US dollar as their currency of choice, as very few live casinos offer Asian currencies such as the Japanese YEN, for example, Royal Panda (site available in English, Chinese and Japanese). Deposit times are usually instantaneous, although withdrawal times vary from site to site. You should keep an eye out for transaction fees and deposit/withdrawal limits, too. These can be found on the same banking/payment method page we mentioned a moment ago. AsiaOnlineCasinos.com provides you with an ample number of sources worth checking out. A resourceful player will check out the list of live casino sites covered at this page first, and see if any appeal to them. Any live casino covered here is guaranteed to be a safe and secure place to play. This resource can often be far more beneficial to players than searching online for themselves, as it eliminates the rogue and blacklisted live casinos out there. You will find that the array of games you have open to you vary from site to site. A live casino which features games from a broader range of casino software providers is likely to carry more games than a live casino which is powered by just a single developer. Some of the more common games you can expect to find at major live casinos include 3 Card Poker, Baccarat (Punto Banco), Blackjack, Caribbean Poker, Casino Hold’em, Dream Catcher and other money wheel games, Dragon Tiger, Football Studio, Roulette, Sic Bo, Ultimate Texas Hold’em and other poker games. In addition, you should note that these games often come in many variants. Some offer just slight changes to the basic rules, and others are quite radically different. Similarly, table limits and VIP versions of games may also be entirely different from the standard version of any live casino game. The betting limits of live casino games vary, depending on the game, the software provider and the casino you choose to play with. VIP baccarat, blackjack and roulette tables are likely to cost substantially more than the standard live tables. At their cheapest, players are looking at wagers of $0.50 to $1, or even $5 per spin/hand on the simpler live tables. Maximum stakes seldom exceed $50 – $100 a game in most live casino games. Of course, it’s a different story when it comes to VIP live dealer games. The upper end of the wagering scale there is quite dramatic, with bets flexible up to several thousand dollars a game, again depending on the VIP table you’re playing at. Well, you can access free live casino games although it is not common. Whether a casino offers free live casino games isn’t a choice the casino itself usually makes. Rather, it is more down to the developer providing the software at the live casino. Some developers do offer this feature, and others don’t. If you can find a live casino which does offer free live casino games, it is an advantage, but you shouldn’t expect that to be the case. Playing live casino games for free is similar to trying free play demos at RNG casinos. At these practice tables, players are given free chips to place bets with, and although they won’t win real money with them, the insight and experience they might gain are valuable. Again, this depends on the software provider. However, most reputable live casino software providers have already made the step into the mobile casino world. When you access a live casino game which is mobile-friendly, it will often need to be played in landscape mode – which is achieved by turning the smartphone sideways. Things to consider when playing mobile live dealer games include the internet connection available, as well as the technology involved. In many cases, you need up to date software and hardware (i.e. modern smartphones), and a decent Wi-Fi or cellular internet connection which won’t cut out. The latter is far more critical when playing mobile live casino games than RNG ones, as you are likely going to be at a table with other human players. 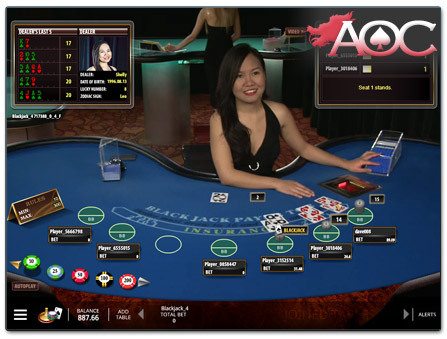 An instant no-no is playing live dealer games over the internet with top-up or Pay and Go phones. Having Wi-Fi or a phone contract is essential. Furthermore, you should also note that mobile-friendly live casino games are fewer in number than online ones. Though instant play in the web browser is becoming vastly commonplace, you may alternatively download an app to your phone or tablet to play the games. Then again, the availability of live casino apps varies from site to site. When playing at live casinos, you are likely to come across the terms “dedicated” and “general”. This can be quite confusing. Fortunately, learning the difference is a doddle. Live casino games are typically streamed from studios or brick and mortar casinos which are operated by the software providers themselves, not the online casinos. As such, players from several different online casinos may all be playing at the same table over the same stream. These are known as general play table games. By contrast, sometimes the human dealers and their games are run in a part of the studio/casino which is reserved for players of a particular casino. These may have specific rules and wagers and are only open to those players of a specific live casino, or even status, such as VIP players. These are known as dedicated table games. Moreover, oftentimes the online casinos run special promotions in conjunction with their dedicated table games. In most cases, you are at liberty to chat to a live dealer. Of course, doing so verbally over a microphone would prove problematic for the real-to-life human dealer. As such, you use a text chat to speak to the dealer – just like you would when talking to a customer support agent at any other site. However, the dealer will reply to you verbally, though, over the video stream. It is important to remember that when speaking to a human dealer, players need to be courteous, polite and respectful. Being aggressive, abusive or disrespectful to a dealer can end a player’s game prematurely, or potentially even see them banned from a live casino. A commonly asked question amongst live casino players is, “can the dealer or anybody else see me?” The answer is a resounding no. The video stream is one way. You can see the dealer and follow the action via the video stream, but neither the dealer nor competitors can see or hear you. There are a few highly exclusive VIP games which have been known to allow players to converse with one another and even activate cameras, but these are super rare. By default, nobody will be able to access your camera or audio. Almost all live casino games can be played in English. Asian players may find a live casino which also offers games in Chinese, Japanese, and other Asian languages, but it is certainly not as common. Again, this is not down to the casino. It is the software provider that determines which languages can be spoken by dealers. Generally, if the player can speak English, they are good to go.